He's a smiling Oxford don with a pipe. How can you not like and trust him? "How, given little over half a century of work, did one man become the creative equivalent of a people?" John Ronald Reuel Tolkien (1892-1973). English linguist (born in Bloemfontein, South Africa), university professor (Leeds and Oxford), Anglo-Saxon historian, CBE, and writer. The man who brought High Fantasy (and, it could be argued, literary Speculative Fiction as a whole) to the modern public. 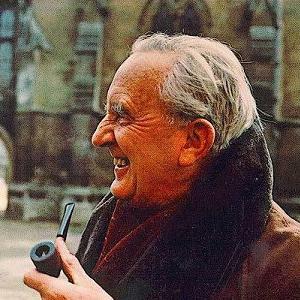 His most famous complete works are his tales of "Middle-earth": The Lord of the Rings and its prefatory novel, The Hobbit. A later work, The Silmarillion, was published in 1977, shortly after he died. In 2007, a fourth book about Middle-earth was edited from many manuscripts to form a consistent narrative, and published as The Children of Húrin. The collective term for all the stories about the world of Middle-earth (not actually the world's name, but the name of a super-continent in a world generally referred to as "Arda" by the peoples therein; it is used here for convenience's sake, being the name far better known to the general reader). The earliest drafts of the great stories of the legendarium were written around the time of World War I, and continued to grow from there on. Tolkien worked on the legendarium for most of his life, continually exploring it further, developing and changing it again and again. The first book published, The Hobbit, actually wasn't intended as part of the legendarium, only to borrow some material. When Tolkien began writing the Hobbit-sequel that was to become The Lord of the Rings, he moved the story of both books into the Middle-earth setting. This fact is responsible for the seeming inconsistencies in tone and canon between The Hobbit and the other Middle-earth works; this is often mistaken for the world and story having matured up by those who do not know it existed before. He also made some minor changes in a later edition of The Hobbit to match better with The Lord of the Rings, while also providing an in-universe justification for the original discrepancies in the latter. Only the first three were published during his lifetime; the rest were published posthumously by his son Christopher. Of these, The Silmarillion and The Children of Húrin consist of a single narrative edited together from Tolkien's texts, while the rest are collections of Tolkien's material (with commentaries and notes by his son), ranging from complete narratives to early and new drafts, to essays. Additionally, there are several titles used for collective bodies of stories (which are used in the fictional world, and also real-world terms to include all relevant material independently of published books): the Ainulindalë and Valaquenta (the creation of the world), the (Quenta) Silmarillion (the First Age), and the Akallabêth (History and Downfall of Númenor in the Second Age). His other works include several shorter tales (including several written for his children) and his academic writings; among these works are. Beowulf: The Monsters and the Critics: This lecture redefined the importance of Beowulf as a poem, rather than "a relic of the past". On Fairy Stories: This lecture essentially inaugurated the academic study of Fairy Tales; we thus have it to thank for stories as varied as Shrek, Princess Tutu, Nights at the Circus, and Revolutionary Girl Utena. Translations of medieval literature that he did in his spare time, including the best-known modern versions of Sir Gawain and the Green Knight, Pearl and Sir Orfeo. The collected Letters of J.R.R. Tolkien are a valuable source of information, both regarding Middle-earth and his personal life and views. Tolkien also aided in compiling the Oxford English Dictionary, and worked on the Jerusalem Bible, a respected Roman Catholic translation. His greatest fiction was based off his linguistic research and invention. His work on this subject filled well over a dozen volumes. Think you'd like to have a legacy like this guy's? Start here! The Appendices made up nearly half of The Return of the King. Exclusively Evil: Tolkien himself was troubled by the Unfortunate Implications. Attention Deficit Creator Disorder: Not so much because there were too many projects, but because Tolkien was a perfectionist and had a day job as a university professor. Christopher Tolkien is still publishing the works never released in his father's lifetime. Author Appeal: In case you missed it, Tolkien likes linguistics, trees, music, and dark-haired grey-eyed women. Author Avatar: Word of God points to Beren and Faramir. Author Phobia: Tolkien was bitten by a poisonous spider in his youth in South Africa and narrowly escaped death. Many of his works feature giant, malevolent arachnids, including the spiders of Mirkwood, Shelob, and Ungoliant. Fought in the Somme during World War I until trench fever made him unfit for further combat duty. He started writing about what would become The Silmarillion while recuperating. He didn't actually fight in World War II, unlike some of his children. But he did accept a tentative offer from British military intelligence to advise their cryptography department -- though it turned out they never needed his services. Does this mean Tolkien almost got a shot at cracking Enigma? Tolkien was a Lieutenant in the Signal Corps. While as such he didn't participate in the actual bang-bang fighting, he was deployed at the front line and lived in the trenches. He later stated we all were Orcs and modelled the Orc mode of fighting after the human wave attacks in WWI. He wrote to one of his sons serving in the military that he rather wished he was out there fighting as well, given the degree to which Hitler ruined a lot of otherwise valid ideas (like the old Germanic theory of courage) through his association with them. Black Speech: The Lord of the Rings is the Trope Namer. Bring News Back: As described in the extended account of the disaster of Gladden Fields. Cash Cow Franchise: With all of the books about Middle-earth out, along with six movies, several games, and tons of merchandise based on films and books, quite a bit of money has been made on Tolkien's world. Cold-Blooded Torture: Both Sauron and Morgoth are fond of it. Crapsack World: Middle-Earth, especially during the Second Age. Creation Myth: The Silmarillion begins with one, called Ainulindalë, or "The Music (literally "singing") of the Ainur". The Ainur are basically the equivalent of the angels in Christianity. Dark Is Not Evil/Light Is Not Good: Well, it usually is; there are exceptions. Destructive Saviour: The people of Beleriand are relentlessly harried and killed by the evil Morgoth. The desperate remnant calls upon the Valar -- extremely powerful gods or angels. The Valar come in force, launch the "War of Wrath"  [dead link] and utterly defeat Morgoth -- but in the process, nearly all of Beleriand is flooded and sinks under the sea, only a few mountain tops surviving as small islands. And what would become the Elven kingdom of Lindon, which was originally the eastern edge of Beleriand (the Blue Mountains being the border of Beleriand). The setting also has a Ragnarok equivalent in which the evil of Morgoth will be entirely purged from Middle Earth. Fortunately or not it will also be The End of the World as We Know It as all of Ea will be remade. Easter Egg: All of Tolkien's works about Middle-earth, as well as the many volumes of unpublished works edited by his son, have inscriptions (usually on the title page) that can be transliterated from his fictional alphabets. Eldritch Abomination: Ungoliant in The Silmarillion. Also, "Far, far below the deepest delvings of the Dwarves, the world is gnawed by nameless things". The Everyman: Hobbits, who also double as the Audience Surrogate in a world of mighty wizards and brave warriors. Evil Cannot Comprehend Good: Invoked. Exploring the Evil Lair: In The Lord of the Rings and The Hobbit. The Fair Folk: Tolkien's treatment of the High Elves was a reaction to the way elves were dealt with in contemporary fiction -- either as this or as childish fairies. In Tolkien only ignorant Men like Boromir regard Elves as The Fair Folk. However, Tolkien's conception then caught on among later fantasy writers and in the end people like Terry Pratchett reacted in turn back towards The Fair Folk. Fairy Tale: Tolkien's lecture "On Fairy-Stories" was a groundbreaking work in the academic study of fairy tales. Fantasy Counterpart Culture: With the exception of the Shire itself, which was modeled on the idealized 19th-century English countryside, the cultures of Middle-Earth are roughly equivalent to those of Dark Age Europe based on political situations and cultural aspects. The political situation of Gondor and Arnor may remind one of Byzantium and Rome, who faced threats from the East (Huns, Ottomans, etc.) at various times in their history. Strangely, when Tolkien was asked about this comparison, he said that he regarded Gondor as being closer to Ancient Egypt. Gondor was a direct descendant of Númenor, whose culture sounds Punic. The fact they were bilingual (speaking both a Semitic-like Adûnaic language and Elvish Sindarin), were a seafaring people and worshipped an evil god named originally Melkor ("He who arises in might") match Ancient Carthage: speaker of both Punic and Greek, seafaring, worshipped an evil god who demanded human sacrifices and was named Melkart ("Mighty one"). The Rohirrim have aspects of Anglo-Saxon culture, and have been compared to Vikings that rode horses rather than ships. Their Eotheod ancestors are based on the then-perception of Goths as a people of Germanic horse-warriors. The Rohirrim military is still this while their language has developed into the later Germanic language of Anglo-Saxon. The fact they had been a people of warrior-peasants whose entire culture ran around the horse and who lived on plains (as opposed to the hilly landscape of the British Isles) also makes them comparable 16th-19th century Russian Cossacks. The Southrons are a vague, nonspecific representation of African peoples, as in the medieval writings Tolkien emulated, which always spoke of these in exotic terms. Similarly, the Easterlings are a vague representation of nomadic peoples from the East (ie Huns, Tartars, Mongols). However, the Easterlings of Khand are called Variags, a term used for Viking mercenaries in Constantinople. The Dwarvish language is inspired by Semitic languages and their displacement throughout Middle-earth draws comparisons with the Jewish diaspora, but the Dwarvish culture resembles more that of Early Middle Ages Germanic peoples: metalworkers, builders, axe-armed. Please note that the languages he based his invented languages on do not necessarily determine the cultural equivalence of the people who use them. Sindarin was based on Welsh, and Quenya on Finnish, but Grey Elves aren't Welsh, and High Elves aren't Finns. Franchise Zombie: As explained above, The Lord of the Rings came into existence only because the publishers wanted a sequel for the immensely popular Hobbit while Tolkien was more interested in working on his legendarium. Tolkien avoided the negative effects of this trope by incorporating both LOTR and The Hobbit into his mythos that was part of the (then unpublished) Silmarillion. Gentleman and a Scholar: He was every inch one of these. Giant Spiders: Ungoliant in The Silmarillion, Mirkwood's spiders in The Hobbit, and Shelob in The Lord of the Rings. Green Aesop: He loved nature and stated that the internal combustion engine was mankind's most evil invention. The destruction of nature by industry is a common theme in his work. Happily Married: To Edith, whom he considered his "Luthien." Hobbits: The Trope Namer, if not the Trope Maker. Howl of Sorrow: In Farmer Giles of Ham. When Giles rides off to slay a dragon, his dog Garm howled all night because he thought Giles would be killed. Humans Are Warriors: All humans except the men of Bree are warriors. Hobbits also avoid warfare, but even these get a few good blows in from time to time. The Edain, the three main human tribes allied to the Elves fit this exactly. They got to Elven country by hacking their way through Morgoth's servants. They were allowed land in exchange for fighting for the Elves, which they did with great vigor. I Am X, Son of Y: The standard form of Warrior Prince self-address in the Tolkien universe. Inter-people Romance: Aegnor/Andreth (Star-Crossed Lovers... Oh, how! ), Finduilas/Túrin (one-sided, Type 5 with Gwindor->F->T), Lúthien/Beren (married and mortal), Idril/Tuor (married and immortal), Arwen/Aragorn (married and mortal), Mithrellas/Imrazôr (married until she pulled a Missing Mom), Melian/Thingol (angel and immortal elf). But Thingol got himself killed eventually, and Melian wandered off to, most likely, Fade Into Nothingness. Inhumanly Beautiful Race: Elves in Tolkien's works are almost invariably described as being good looking. The three best looking females in Middle-earth are all Elves. The Valar also count, although they cheat, since their bodies are artificial and custom-made, so their beauty is limited only by ego and imagination. Literary Agent Hypothesis: In-universe, the Middle-earth books are translations of the writings of Bilbo (who wrote The Hobbit and translated The Silmarillion out of Elvish), Frodo and Sam (who wrote The Lord of the Rings), and the Anglo-Saxon sailor Ælfwine (who stumbled upon Tol Eressëa in the Middle Ages and learned of the Elder Days from the Elves). "Real" men don't cry: Oh the HELL they don't. To cite just one example: Aragorn is so overwhelmed with grief at the death of Boromir, weeping bitterly over the latter's body, that when Gimli and Legolas come upon the scene, they think at first that Aragorn himself has been perhaps mortally wounded. Also, Gandalf encourages Sam, Pippin, and Merry to weep when Frodo is going away forever. Most Wonderful Sound/Hell Is That Noise: Part of Tolkien's aim in devising the Elvish languages and the Black Speech. He deliberately tried to make one sound beautiful and the other sound ugly. Mysterious Backer: Eru and the Valar in all of his works. Theme Naming, various kinds: Theme Family Naming (including Theme Twin Naming and Alphabetical Theme Naming), naming conventions along a dynasty (be they birth or ruling names), or general ones (e.g. the hobbit tradition of naming girls after flowers or gemstones). Eucatastrophe: Tolkien coined the word "eucatastrophe" to describe this trope. No Man of Woman Born: The Lord of the Rings is co-Trope Namer with Shakespeare. Our Elves Are Better: Very much not, even if many people mistakenly think so. Yes, Elves are in many ways more powerful, "magical" and skilled than humans (they had better be, as they had long enough to practice), but they are just as capable as any human to be stupid, chauvinist, and screw up monumentally – possibly more able than humans in fact, as greater power can have bigger results, plus they have more lifetime in which to get worse. In addition, humans are created to be Immune to Fate, with the ultimate destiny of ourselves and the world left undetermined. Doubters are referred, for a start, to the story of Feanor, the greatest creative genius in the history of the Elves, whose stubbornness and selfishness led to the millenia-long exile of almost his entire branch of the High-elven people, the Noldor, from the Blessed Lands, to civil war in those same Blessed Lands between two of the three tribes of the High-elves, to the destruction of the Elven kingdoms of Beleriand and of Beleriand itself, and to the deaths of himself and almost all his sons. They do, however, appear to be this in The Lord of the Rings, since it isn't concentrating on Elvish history, and so most of their bigger mistakes are found elsewhere. Now, since it's the most popular and well-known of Tolkien's works, this means it's easy for people to get the wrong impression. This being said, Galadriel is shown to be just flawed as susceptible to the One Ring's power as anyone, although she is one of the handful who resist its power. This is partly justified by the fact that elven leaders in the Hobbit and Lord of the Rings: Elrond (Rivendell), Thranduil (Mirkwood) and Galadriel and Celeborn (Lothlorien) have all lived to see the decline of their race in Middle-Earth, and are trying to do what is best for their people while offering what assistance they can to the other races. Also, considering that Galadriel and Celeborn were alive during the war against Morgoth that destroyed Beleriand (caused by Feanor, as noted above), and that Elrond saw what the folly of his people could do (it was Fëanor's grandson whom Sauron taught how to make the rings of power), they had all probably wisened up to not repeat the mistakes of their ancestors. Oxbridge: Quite possibly the most widely-read writer to come out of Oxford's walls. Palantir Ploy: The Palantir devices in The Lord of the Rings are the trope-namers. Recurring Dreams: Tolkien had his 'Atlantis dream', featuring a huge wave coming over the land. He stated that it had a part in inspiring the Downfall of Númenor. Speak Friend and Enter: The Lord of the Rings is the Trope Namer. Supporting Leader: Former Trope Namer (The Aragorn) and possibly Trope Maker. "I regret that I am not clear as to what you intend by arisch. I am not of Aryan extraction: that is Indo-Iranian; as far as I am aware none of my ancestors spoke Hindustani, Persian, Gypsy, or any related dialects. But if I am to understand that you are enquiring whether I am of Jewish origin, I can only reply that I regret that I appear to have no ancestors of that gifted people." Tolkien sent his publisher two versions of this letter -- this one, and a stronger version -- and let the publisher choose which letter to send. Since the "mild" version is the one which remained in Tolkien's file, it may be presumed that the "wild" version was used. Tolkien also sent a Strongly Worded Letter to A. A. Milne, complaining about the Adaptation Decay from The Wind in the Willows in Toad of Toad Hall and saying that his children were appalled. Somewhat Hilarious in Hindsight as Tolkien fans are famously equally stringent about Adaptation Decay in Tolkien's own works. Tender Tears: Tolkien is rare amongst Western artists for creating consistently sensitive and soft-hearted men who do not see crying as shameful or dishonorable. Translation Convention: All of our real-world languages do not exist in Middle-earth, and so the common Translation Convention applies. When not convention-translated, names and speech make use of either Tolkien's constructed languages, or of a real-world language used as stand-in for a fictional one. The latter ones are not chosen randomly, but to represent the relation between the respective "proper" languages, or a certain image. Languages regularly replaced by stand-in languages in the text are: "Westron" a.k.a. the "Common Speech" is always rendered as English (as it is the Third-Age-novel's POV-character's language), the Rohirric language by Anglo-Saxon a.k.a. Old English (to appear vaguely familiar to the hobbits' Westron-English), and the language used by the Dwarves and the Men of Dale by Old Norse. Information on the "translation" and what these languages "really" look like, can be found in various appendices and additional texts. Tsundere: Towards C. S. Lewis and, even more severely, Dorothy L. Sayers. Walk Into Mordor: The Movie of The Lord of the Rings is the Trope Namer. War Is Hell: Constant theme since Tolkien is a World War I vet. Warrior Prince: By the bucketload. Tolkien once proposed coauthoring a scholarly book on linguistics with his academic colleague and friend C. S. Lewis. Lewis started the manuscript, but unfortunately they never got around to finishing it. See here. For that matter, it's hard to keep from feeling wistful when reading the many fragments of unfinished stories and poems collected by his son Christopher in The History of Middle Earth. There's even a whole volume of them entitled Unfinished Tales. When Trees Attack: The Ents were created because Tolkien had seen a production of Macbeth as a child and was disappointed when it turned out that the forest itself didn't actually attack. "Well Done, Son" Guy: Faramir could be the poster boy for this trope. A Worldwide Punomenon: One way to view the Akallabêth in The Silmarillion is as a thirty-page build-up to a godawful multi-lingual pun. You Shall Not Pass: Gandalf's speech in the movie The Fellowship of the Ring, while a slightly paraphrased variation of the speech in the book, is the Trope Namer. ↑ Ælfwine was written out of the published Silmarillion by Christopher Tolkien, but since he appears in JRRT's writings after LotR, he apparently never abandoned the idea. This page was last edited on 17 September 2018, at 14:35.